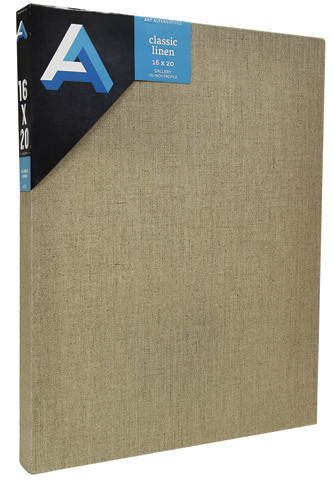 This canvas allows the texture and color of linen to show through and be incorporated into your artwork. The original artist's canvas, the longer fibers of linen create a stronger, more durable surface than cotton. This finely woven 7 oz. Belgian linen is lightly primed with acid-free clear acrylic gesso to a finished weight of 9 oz. and stretched around and back-stapled to 1-3/8" deep, kiln-dried solid pine stretcher bars. Sizes with a dimension of 24" or longer are braced for additional support. It is ready to use with acrylic paints and other wet or dry media. Apply an additional primer to create an archival surface for use with oils.